From Lucio Fulci's horror movie - Gates of Hell - comes this fantastic zombie mask. All latex and individually hand painted for the most realistic look possible. One eye is covered with black mesh so that you can see out, but others can't see in. The other eye is as shown and you see out over it. This Halloween mask full covers your neck. 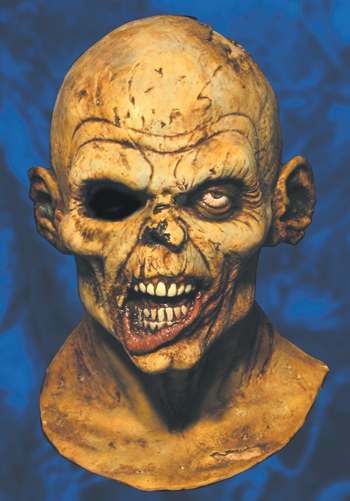 I have this great mask, as well as other zombie masks from Halloween Asylum. Thay all have amazing detail and coloring! I use them as an attack zombie mob in my yard! Even the adults are shocked at their creepiness! I also use a fogger to add to the scariness. Some people actually think they see them move!